When you're grilling meat on your Weber barbecue, you're typically exposing it to intense, direct heat. This cooks the meat very quickly and browns it well, but it doesn't allow a lot of time for heat to penetrate into the interior of the meat. With a steak or a chops, direct heat isn't a problem. Those cuts are thin enough that the middle gets cooked before the outside is charred and overdone. However, that's not the case with a full-size roast. The good news is that you can cook a roast on your Weber grill using indirect heat. Pat the roast dry with paper towels, then season it liberally with salt and pepper. If you wish to rub it with a dry spice rub or flavoring paste, this is the time to do so. Leave the roast at room temperature for one hour to warm up. Set up your Weber grill for indirect cooking. On a charcoal grill, divide your coals into a bed on either side of the grill, with a gap in between. Place a drip pan in the gap. On a gas grill, heat the grill to 325 degrees Fahrenheit, and then turn off the middle burner. Place your roast in the middle of your charcoal grill, over the drip pan. On a gas grill, place a disposable foil roaster in the middle and set the roast in it, on a rack. Cover the lid. Adjust the heat, as necessary, to maintain a steady 325 F throughout the cooking time. Cooking times will vary according to your choice of roast, but 20 minutes per pound is a good rule of thumb in most cases. Test the roast's doneness with a meat thermometer. When the roast reaches 120 to 125 F, remove it from the grill. Raise the grill to its highest temperature, and use it to sear the roast on all sides. Cover the roast and let it rest for 15 to 20 minutes before carving. Add a few moistened wood chips to the grill to add a hint of smoke to the flavor of your roast. 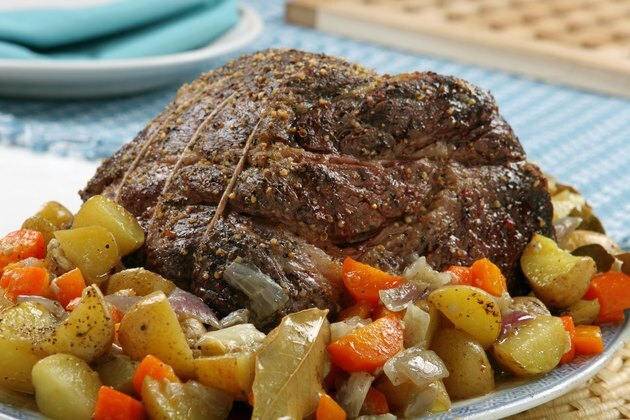 In some cases, it may be more convenient to finish and brown the roast indoors in your oven. Preheat your oven to 450 F -- and cook the roast at this heat for approximately 15 minutes to brown it. Remember to rest the meat for 15 minutes before carving. Letting the juices run into a drip pan helps prevent flareups, and it also gives you a pan full of tasty juices with which you can make gravy. The USDA's recommended safe internal temperature for roasts is 145 F.